Nigeria coach Shaibu Amodu refused to be drawn on whether he will still be in charge of the Super Eagles at the World Cup in South Africa in June. Amodu would not answer questions on his future after Nigeria's 1-0 loss to Ghana in the semi-final of the Africa Cup of Nations in Angola. "I won't talk World Cup now," he stated simply after the game. 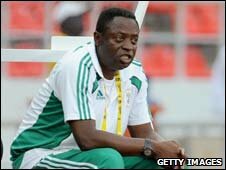 There has been pressure on Amodu from fans and media in Nigeria throughout the tournament. When asked if he had any doubts whether he would be there for the World Cup Amodu simply replied: "I don't know what you mean." The Nigeria Football Federation president Sani Lulu Abdullahi says they will be carrying out a full review of the team and its organisation - including the coach - in the coming weeks. Amodu insists that he is happy with his side's performance in Angola and added his side were unlucky against Ghana. "We have no excuse, we lost to a luckier side, a youthful team, but its not a bad side they worked hard to defend their one goal," he said. "We lost to bad marksmanship in front of goal. "I'm satisfied - semi-final is not a bad performance." He also believes that his team will learn from the experience at the Nations Cup in time for the World Cup. "We have to go back and learn from the lessons we have learnt here, go back home and prepare and make sure we improve on the team," Amodu added. "Even though it was a bad start it took experience and youth to gel together to be able to come this far which means the team has got potential. "We really have to have confidence in ourselves, believe in ourselves and work a bit harder particularly in the areas where we are lacking and we can have a good team at the World Cup."